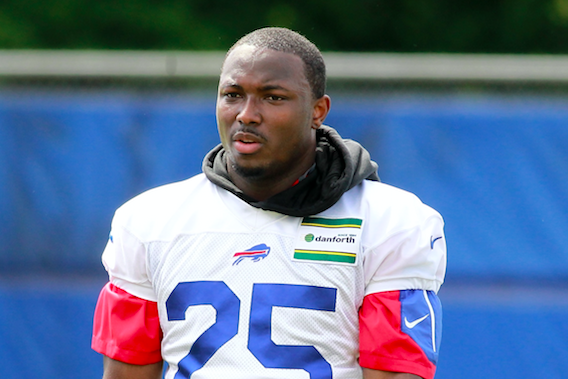 Buffalo Bills running back LeSean McCoy (25) takes part in drills during the team's NFL football minicamp in Orchard Park, N.Y., Wednesday, June 15, 2016..
Former Philadelphia Eagles running back LeSean McCoy has been sued by two Philadelphia police officers injured in a widely publicized brawl on February 6 at a bar in Old City. According to ESPN, the civil lawsuit was filed against the 28-year-old Buffalo Bills star by Philadelphia police officers Darnell Jesse and Roland Butler, who both suffered series injuries in the fight at the Recess Lounge, 125 S. Second Street. Video from the scene of the fight went viral after it was obtained and published online by gossip site TMZ. "Our investigation has confirmed that [officers] Darnell Jessie and Roland Butler were viciously attacked and beaten by LeSean McCoy and the additional defendants. As a result of the violent assault, both men have suffered serious and permanent injuries," said Fortunato N. Perri Jr., the attorney for the police officers involved in the fight. Jessie was admitted to Hahnemann University Hospital on Feb. 7 and treated for a laceration over his left eye a possible skull fracture. Butler, who left the scene at Recess Lounge, suffered a broken nose, broken ribs, a sprained thumb and a laceration to his right eye. He received treatment at Delaware County Memorial Hospital in Upper Darby. Authorities said the disagreement arose over a $350 bottle of champagne. Two months after the incident, Philadelphia District Attorney Seth Williams announced that there would be no charges brought against McCoy, citing "insufficient evidence" to prove that any individual involved in the fight committed a criminal offense. Philadelphia Fraternal Order of Police President John McNesby, who had called for McCoy's immediate arrest, harshly criticized the District Attorney's Office for its handling of the investigation, publicly calling the attack an "all-out beatdown" on the officers involved. The Pennsylvania Attorney General's Office later reviewed the case and decided in July to uphold Williams' decision not to prosecute. In a letter to McNesby, then-Pennsylvania solicitor general Bruce Castor wrote that the legal standard would not enable him to find that Williams abused his discretion. “My job was not to decide if anyone acted properly or not," Williams said at the time he declined to charge McCoy. "I do not condone bar fights. My job was, solely, to determine if evidence exists to charge anyone with a crime." McCoy is named in the lawsuit along with Curtis Brinkley, Tamarcus Porter and Christopher Henderson, who accompanied him to the Recess Lounge. Had McCoy been hit with an NFL suspension for even one game, he would have risked the loss of $18 million in guaranteed money in the $40 million contract he signed with the Bills after the Eagles traded him in March 2015. Read the full story at ESPN.